Terry Crews is not the voice actor, unfortunately. 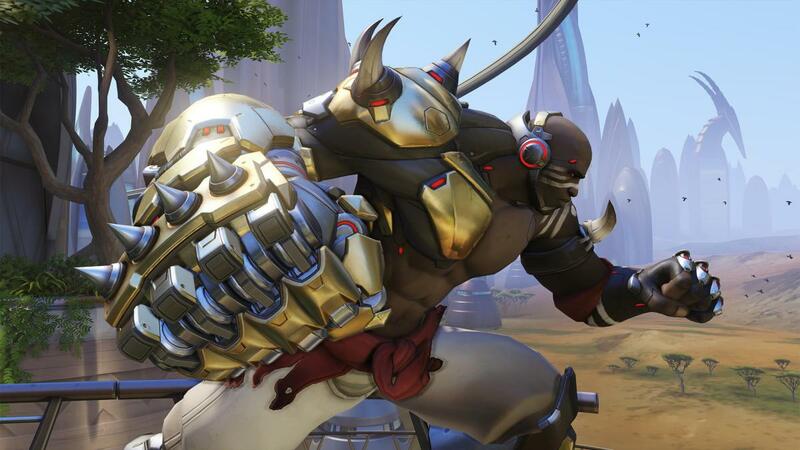 It has been a long time coming, but Doomfist has been officially revealed as the 25th hero in Overwatch. There is no release date yet, but the character is now on the Public Test Realm, which means a launch is coming within the next week or two. Doomfist is an offensive character - obviously - and brings several abilities to a fight, mostly from his powerful Gauntlet. His Hand Cannon can fire four projectiles from it, one at a time or all at once, and he also has a Rising Uppercut that knocks enemies into the air. Rocket Punch knocks enemies back, and deals extra damage if they are thrown into a wall. Seismic Slam is an AoE that draws enemies toward him, while his ultimate is Meteor Strike, where he leaps in the air and cause massive AoE damage when he lands. His passive is The Best Defense, which generates a shield every time he uses an ability. For those interested in the lore, Doomfist is Nigerian and is one of the leaders of Talon, along with Reaper. His philosophy is that Earth will only get stronger through conflict, which will continually put him at odds with the Overwatch heroes. Much to the chagrin of fans, Terry Crew will not be voicing Doomfist. Instead, theater director and actor Sahr Ngaujah will take on that role. Crews is an avid Overwatch player and had lobbied heavily for the role. He even visited Blizzard studios in December, leading to speculation that he had indeed been cast as Doomfist.